Gym-Jesters is a "dream come true" for Helen Fry, who was formerly a physical education teacher. Helen and her husband Tom, who is a Heritage High School counselor, have been the driving force behind Gym-Jesters since 1962. We originated in the Saginaw Township Community Education Program. In 1978 we entered the world of business and moved to the Gratiot and Center road location. In 1986 we moved into our current location at Weiss and Pine. The 18,500 square feet makes our three gym facility and program one of the best in the nation [we checked]. Our pre-school program is outstanding. Approximately 900 young people attend annually. We offer patient and individualized instruction at all levels. Pre-school years are precious in terms of time and development. Children learn a great deal about themselves during these years. Our "brain window" is open to language and basic motor skill development from birth through five. Pre-school is the most important time to encourage movement education. For the past forty-five years Gym-Jesters has offered amazing programs for children as young as 9 months. Basic loco-motor skills, bats, balls, swinging, striking, kicking, throwing, fitness, and creative rhythms make up our yearly curriculum. We incorporate musical games using colors and shapes. Activities progress as your child grows; music, fitness, basic gymnastics and cooperative skills are emphasized. Helen J. Fry, former Saginaw Township physical education teacher, in the 1960's realized early in her career how important basic movement is to our youngest children. A young child's life should be about wonder, discovery and experience. The first package of self-confidence and self-esteem skills we can offer our children involve their ability to manage themselves, their bodies. Fry refers to it as "body management skills." Pre-school children are oblivious to ranking, judgments and critical observations, unless those thoughts are forced upon them. Children have so few years to explore freely and it is my opinion that our society has taken a step backward, failing to provide appropriate activities, in a comfortable arena, at the appropriate time. We have too many children entering school without all the basic skills, unable to take safe risks and not willing to enjoy a love of physical activity. By the time children enter school, they are no longer free spirits. Kindergarten children begin to recognize their own personal qualities and those of their peers. Some children begin to realize they may not measure up very well and many quickly become afraid to try new things. Where has all the confidence gone? Children coming up short with gross motor and organizational skills may not be able to cope with the expected academic achievement found in our schools today. For the past thirty years Gym-Jesters has offered the solution to all parents who wish to see their children confident with themselves. Two to three years in our program challenges and changes a child's concept of their abilities for the rest of their life. Do you remember when you first rode a bicycle? 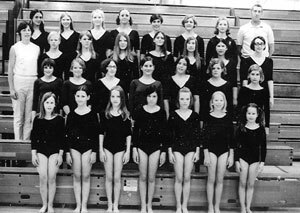 Mrs. Fry states, "Many adults have shared with us their childhood memories of hours spent at Gym-Jesters." It is wonderful to watch fears melt away and confidence grow. Gym-Jesters is able to take children out of their comfort zone, in a very comfortable learning space. I know for a fact, that we have impacted the lives of thousands of children. In addition, our classes are small and we have lots of equipment in a large friendly facility. We offer the opportunity to work on listening skills and small group cooperation. Gym-Jesters is PEPFP (Progressive, Educational, Purposeful, Fun, Play), text message your friends about PEPFP. Come and join us! Visit our website to view a brochure and additional information at www.gymjesters.com - we are located at 323 Weiss Street. Call 989-754-7401 to register. For a more in-depth history of Gym-Jesters, click here.